In practice, walkability measures how easy it is to live in a place without being forced to own a car, or at least to use it for everything, even buying some bread, every day. One of the ways to measure the walkability of an address is to assign a score between 0 and 100 to it, called “walkshed index”. A walkshed is the area (usually a circle with a one-mile radius around one’s address) within which a family can move easily without a car, just by walking. The walkshed index depends on how many different things which are either pleasants to do (practicing sports, going to theathers or museums…) or just necessary for everyday life (going to grocery stores, schools, medical centers, city offices…) you could do inside your walkshed, that is without driving! As an example, walkshed indexes higher than 90 indicate “Walking Paradises”, that is addresses where you could live without problems without ever using a car. Scores below 25, instead, identify places whose residents can only walk from their doorstep to their car! However you measure it, walkability is just a number, not some magic talisman. (luckily) It is very difficult, if not impossible, to put everything that means quality of life inside a formula. Climate, beauty, low crime rates, width of sidewalks, availability and efficiency of public transportation are all factors not considered in the automatic walkability calculators available today (see below). Even the total number of cars lowers walkability. In Italy, for example, there are many cities or neighborhoods that were born 100% walkable, but today are unlivable because of cars (parked or moving makes no difference) covering every square meter of outdoor space, sidewalks included. Even considering all these factors, the walkability numbers already available are very useful and nobody should ignore those of the place where they live, if nothing else just because they are numbers, obtainable and comparable with an objective procedure. High walkability means much less stress, many more occasions for entertainment, more health and, according to a report published in August 2009 “translates directly into increases in home values”. Where can I find the walkability of my home? 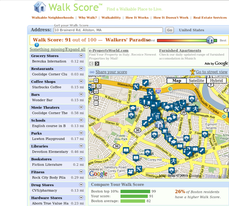 Walkscore and Walkshed Philadelphia are two websites that calculate and display on a map the walkability of an address. The second one (which also lets each user set his or her own criteria) only serves Philadelphia, while Walkscore currently covers United States, Canada, and the U.K.
What if I live somewhere else? If the websites mentioned above cannot help you, there are three ways to obtain a similar service for your area. The first and probably the fastest one is to ask the OpenStreetMap volunteers closer to where you live if they could please implement a similar web interface (it’s not such a difficult task for a good programmer, if the basic data are available). The second is to ask who should already have done it, that is your City Administration. Walkability measures can help local politicians to know what really is needed in the area they serve, instead of what is more convenient for some lobby. The last method is not always applicable but should become a rule: ask a real estate agent what is the walkability index of the house she’s trying to sell you, adding that you won’t deal with agencies that don’t include such informations in their listing. The underlying concept in all cases is always the same: if you live in a city, high walkability is for you both a right and a responsibility (towards yourself and your neighbours).